Hello! Today I have my September Christmas Cards to show you. As most of you already know, I play the Splitcoaststampers Christmas Card Challenge where we make Christmas Cards all year long so that were not stressed out during the busy Holiday Season. I make about four Christmas Cards a month so that I'll have about fifty cards at the end of the year. This month I was really inspired by a lot of Christmas Cards I saw on the web. Some of my cards are direct cases, and others have variations from the original. For my first card, I was inspired by this one by this one HERE. I copied the village scene, but used different stamps and sentiments, and eliminated the bow. Flower Soft and glitter were added for the snow effect. The stamps are a mix of Papertrey Ink, and random dollar stamps. When I first saw THIS card I was awestruck. I cased it almost directly--why mess with perfection? The only things I changed were the ink colors and sentiment stamps because I didn't have the ones the original artist used. I love how she used a die cut to cut out out one of the houses....brilliant! I wish I could think of such wonderful, creative ideas like this! All the images and dies are from Papertrey. For my next card, I only cased the layout of this card HERE. 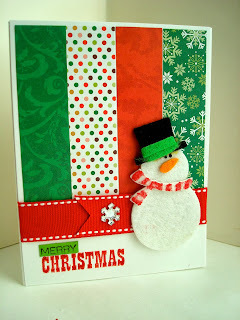 I used a pre made felt image purchased at a craft store, instead of a stamp, and then I changed the papers and stamps. The holiday papers are from DCWV and the stamp is a dollar stamp from Studio G.
And my final card is also almost a direct case. I absolutely loved the idea of using embossed basic Kraft paper to simulate a fire place mantel. You can see the original card HERE. I kept the exact same concept as the original card, but I changed the embossing folder to a brick wall embossing folder by Darice, used a Studio G Dollar Stamp instead of a die by stamping my image onto two different shades of card stock and cutting them out. I then put Liquid Applique on the top of the Stockings and added a metal adhesive gem to portray a nail. I changed the sentiment with another Studio G stamp, and colored in a portion of the sentiment with a purple gel pen. The natural hemp of the original card, was changed to a purple one to bring in a bit more color. Your cards are gorgeous Amy!! I love them all but I think the ones with the building are my fave! !